Originating in Renaissance Italy, but achieving popularity across Europe, Commedia Dell’Arte is a special type of improvised comedy. 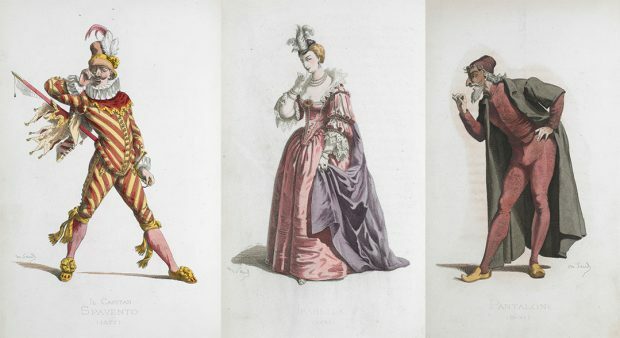 It involves stock characters – comic servants, young lovers, self-important pedants and soldiers – each one recognisable by stylised costumes, masks and exaggerated gestures. Troupes of Italian players may have travelled through London in the 16th century, and Shakespeare drew on the tradition in comedies such as Twelfth Night, The Taming of the Shrew, As You Like It and The Tempest. And now it comes to Thurrock thanks to the Complete Commedia Company and Thurrock 100 Tales! The chatty, acrobatic servant; an anarchic, brilliant schemer who unwittingly complicates, exacerbates and infuriates those he is supposed to help. The mean-spirited, avaricious, lecherous, cuckold; he is an old, obstructive father and comically, tyrannical master of his under-paid, bullied servants. The waffling, boffin; an intellectual windbag; an ineffectual father and master; why use one word when ten will do? The desirable, female lover; hopelessly devoted to love. Beautiful, educated, petulant and spoilt. The handsome, male lover; hopelessly infatuated with Isabella. Fashionable, vain and melodramatic. The pretentious, self-promoting braggart; extravagant and sonorous; ridiculous and cowardly; he boasts of his imaginary conquests at war. Fancies himself as a winner with the women. The quarrelsome, belligerent, servant; a loner; he has a fatalistic philosophy and takes great pleasure in violence. The captivating lady’s maid; coquettish and clever; she manages the plot with wit and benevolence; adored by everyone.